1. the passage by which air enters and leaves the lungs. 2. a mechanical device used for securing unobstructed respiration when the patient is not breathing or is otherwise unable to maintain a clear passage, such as during general anesthesia or respiratory arrest. Oropharyngeal Airway. This device is inserted into the mouth to prevent the tongue from obstructing the pharynx. It should not be used on alert or semiconscious patients, as it invariably stimulates the gag reflex and causes vomiting or injury to the jaw unless the patient is deeply unconscious. Selection of proper size is essential because an airway that is too short cannot lift the tongue away from the oropharynx. The airway should be gently inserted so as to avoid trauma to the mucous membranes. It must be inserted with the tip up and rotated 180 degrees when it reaches the back of the throat so that the tongue is not displaced back into the pharynx, where it will obstruct the air passage. The proper size is the distance from the earlobe to the edge of the mouth. Esophageal Obturator Airway. This is a hollow tube inserted into the esophagus to maintain airway patency in unconscious persons and to permit positive-pressure ventilation through the face mask connected to the tube. It was designed to be used by trained pre-hospital medical personnel to establish an airway. Its use has declined because of training of pre-hospital medical personnel in the insertion of endotracheal tubes, and because studies have suggested poor performance. Esophageal Gastric Tube Airway. This is a hollow tube with a balloon at the end, which is blindly inserted into the esophagus, obstructing the esophagus and theoretically forcing air into the trachea, thus decompressing the stomach and alleviating abdominal distention; it represents an improvement in the design of the esophageal obturator airway. Ventilation occurs in the oropharynx. Nasopharyngeal Airway. This is a hollow tube placed through the nose into the nasopharynx to bypass upper airway obstruction or to decrease trauma from nasotracheal suctioning. Endotracheal Tube (or Airway). This inflatable tube is inserted into the mouth or nose and passed into the trachea to provide mechanical ventilation, to provide a suction route, to prevent aspiration of stomach contents, and to bypass upper airway obstruction. airway clearance, ineffective a nursing diagnosis accepted by the North American Nursing Diagnosis Association, defined as inability by an individual to clear secretions or obstructions from the respiratory tract to maintain a clear airway. Etiologic factors include decreased energy and fatigue; infection, obstruction, or excessive secretions in the tracheobronchial tree; perceptual/cognitive impairment associated with decreased oxygenation to brain cells; and trauma to the respiratory tract. Defining characteristics presented by a person with ineffective airway clearance are likely to include abnormal breath sounds, alterations in respiratory rate or depth, cough (effective or ineffective and with or without sputum), cyanosis, dyspnea, and possibly fever. Patient Care. Goals and outcome criteria for planning and interventions to prevent, minimize, or alleviate ineffective airway clearance will depend on the patient's medical diagnosis, specific nursing diagnoses, and related pathophysiology. In general, the goals are to promote the movement of air in and out of the lungs; prevent development of infection, atelectasis, and accumulations of stagnant secretions in the lungs; and encourage preventive and therapeutic pulmonary hygiene to maintain good ventilation. Some appropriate nursing interventions to accomplish these goals might include teaching the patient effective coughing practices, assisting with postural drainage and other techniques used by the respiratory therapist to remove secetions from the respiratory tract, helping the patient to stop smoking, helping the patient identify and avoid allergens in the environment, maintaining a clean and infection-free environment, repositioning and encouraging early ambulation in post-surgical patients, and providing instruction in ways to avoid extreme fatigue in patients with chronic obstructive pulmonary disease. conducting airway the lower and upper airways together, from the nares to the terminal bronchioles. lower airway the airway from the lower end of the larynx to the ends of the terminal bronchioles. upper airway the airway from the nares and lips to the larynx. 1. 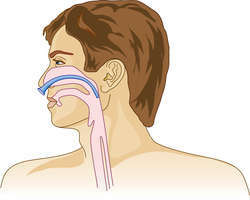 Any part of the respiratory tract through which air passes during breathing. 2. In anesthesia or resuscitation, a device for correcting obstruction to breathing, especially an oropharyngeal and nasopharyngeal airway, endotracheal airway, or tracheotomy tube. 2. a device for securing unobstructed respiration. esophageal obturator airway a tube inserted into the esophagus to maintain airway patency in unconscious persons for positive-pressure ventilation through the attached face mask. conducting airway the upper and lower airways considered together. laryngeal mask airway a device for maintaining a patent airway without tracheal intubation, consisting of a tube connected to an oval inflatable cuff that seals the larynx. lower airway the airway from the inferior end of the larynx to the ends of the terminal bronchioles. 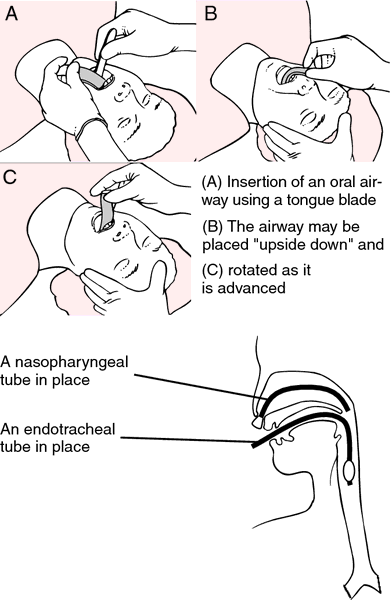 nasopharyngeal airway a tube inserted through a nostril, across the floor of the nose, and through the nasopharynx so that the tongue does not block air flow in an unconscious person. oropharyngeal airway a tube inserted through the mouth and pharynx so that the tongue does not block air flow in an unconscious person. Airway. Oropharyngeal airway in place. 1 a tubular passage for movement of air into and out of the lung. An airway with a diameter greater than 2 mm is defined as a large, or central, airway such as a mainstream bronchus; one smaller than 2 mm is considered a small, or peripheral, airway such as a terminal bronchus. 2 a respiratory anesthesia device. 3 an oropharyngeal tube used for mouth-to-mouth resuscitation. 2. anesthesia During resuscitation, a type of device to correct obstruction to breathing, especially an oropharyngeal, nasopharyngeal, or endotracheal airway, or tracheotomy tube. 1. The passages from the nose and mouth down to the air sacs in the lungs, by way of which air enters and leaves the body. 2. A curved plastic air tube often used by anaesthetist to prevent the tongue from falling back and obstructing breathing. 2. In anesthesia or resuscitation, device to correct obstruction to breathing, especially an oropharyngeal and nasopharyngeal airway, endotracheal airway, or tracheotomy tube. n 1. a clear passageway for air into and out of the lungs. 2. a device for securing unobstructed respiration during general anesthesia or in states of unconsciousness. n a method of opening the trachea of an individual by manually changing the position of his or her head in order to perform rescue breathing. n an abnormal condition of the respiratory pathway characterized by a mechanical impediment to the delivery or to the absorption of oxygen in the lungs, as in choking, bronchospasm, obstructive lung disease, or laryngospasm. n an alternate method of removing an obstacle lodged in the airway by compressing the sternum; used when pregnancy or a patient's body size render the Heimlich maneuver impossible or inappropriate. See Heimlich maneuver. n a method of removing an obstacle lodged in the airway of an infant by placing the child facedown along the forearm and striking the child's back with the opposite hand. See Heimlich maneuver. n the ratio of pressure difference between the oral cavity, nose, or other airway opening and the alveoli to the simultaneously measured resulting volumetric gas flow rate. 2. a mechanical device used for securing unobstructed respiration during general anesthesia or other occasions in which the patient is not ventilating or exchanging gases properly. Includes an endotracheal tube and a tracheostomy tube. in the unanesthetized animal is usually caused by vomitus or laryngeal spasm due to foreign material in the larynx. In the nonintubated anesthetized animal, it is caused by caudal displacement of the tongue and epiglottis, accumulation of mucus, saliva and blood in the pharynx or laryngeal spasm resulting from that accumulation. In the intubated animal, faulty placement or functioning of the endotracheal tube or kinking of it can cause obstruction of the airway. The signs of obstruction are deep, asphyxial respirations, struggling and great agitation in the conscious animal. Deeply anesthetized animals simply show a decline in respiratory efficiency. aid in the removal of secretions and foreign material. See also cough, sneeze. the resistance to airflow through the respiratory tree and any addition to the airway, such as the endotracheal tube and connectors in a closed circuit anesthetic machine. It is known that the important causes of impaired airway reflexes increased tendency to regurgitate are diabetic autonomic neuropathy and diabetic peripheral neuropathy. lignocaine on airway reflexes elicited by irritation of the tracheal mucosa in humans anesthetized with enflurane. 12,13,14] In our study, the addition of low doses of succinylcholine provides adequate suppression of airway reflexes, and better jaw relaxation for easy insertion of LMA. Induction regime for LMA insertion should provide a depth of anaesthesia with a relaxed jaw and suppressed airway reflexes for the device to be tolerated within the hypopharynx without undue coughing, gagging and patient movement. Comparison of the effects of dexmedetomidine versus fentanyl on airway reflexes and haemodynamic responses to tracheal extubation during rhinoplasty: a double-blind, randomized, controlled study. Intravenous lignocaine has been used to suppress cough during tracheal intubation, (5) laryngospasm and cough during extubation, (6,7) and airway reflexes elicited by the irritation of tracheal mucosa. 2%) as appropriate to allow reasonable intubating conditions without unwanted airway reflexes. Gagging occurred in a small number of patients in both groups due to inadequate suppression of airway reflexes. Excessive sedation may result in cardiac or respiratory depression and depression of protective airway reflexes. 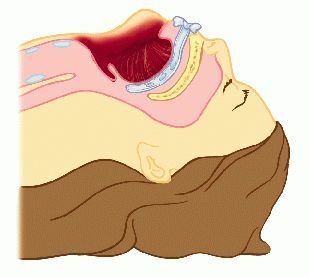 Satisfactory insertion of the laryngeal mask airway after induction of anaesthesia requires sufficient depth for suppression of airway reflexes and to avoid untoward effects due to airway instrumentation. Critically ill patients are at particular risk due the presence of an endotracheal tube or tracheostomy, a decreased level of consciousness with obtunded airway reflexes, and the inability to report chest discomfort or dyspnoea after tube insertion (5). The present study was carried out to assess the effectiveness of IV Dexmedetomidine in attenuation of airway reflexes and hemodynamic responses during endotracheal extubation.